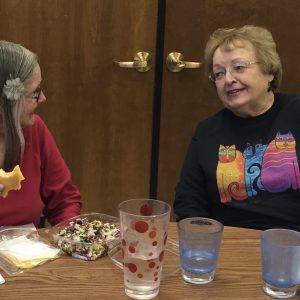 The Ladies Who Do Lunch group supports the Lifted Spirits, a respite shelter for women at risk in downtown San Jose, providing lunch and activities once per month. Section members meet on the third Wednesday of the month to cook and serve a hot lunch at Lifted Spirits. They choose the dish they will prepare from a pre-set menu, deliver it at 11:45 a.m. and serve and socialize until 1:15 p.m. Contact Chair Alice Gosak Gary for more information.